This popular variety is commonly called America’s favorite snacking apple. It was discovered in 1874 as a chance seedling growing on a farm owned by Jesse Hiatt in Peru, Iowa. Thinking it was a nuisance, Hiatt tried to chop down the seedling, but the tree grew back repeatedly. On the third time, Hiatt allowed it to grow and the tree produced red apples. Hiatt originally called the seedling variety Hawkeye. He displayed the apples in 1893 at a fruit show in Louisiana, Missouri, sponsored by the Stark Brothers Nursery. The Stark brothers purchased the propagation rights to the apple and commercialized the variety, renaming it Red Delicious. Since then, Red Delicious has become the flagship variety of the Washington apple industry. It grows better in Eastern Washington’s dry climate than in any other location in the world. Red Delicious production has declined in recent years as more apple varieties have been introduced. However, Red Delicious is still considered a favorite among apple buyers for its sweet flavor, firmness, and long shelf life. 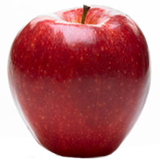 Red apples are identified by their shiny, bright red skin. They may have some “blush” or tanning along the crown. Minor russeting around the stem may be apparent. America’s most popular apple, known for the “five little bumps” on the bottom.